Everyone looks forward to the time of the Atlantic tarpon, otherwise known as the “silver king.” There are many different types of tactics to catch these fish, as they push through the mouths of bays, deep channels, edges of flats, and rock piles. The silver king is the most powerful (pound for pound) sport fish that lurks the shallow coasts of our hometowns. They are known for making great fights, awesome pictures, great stories, and aggravated anglers at times. 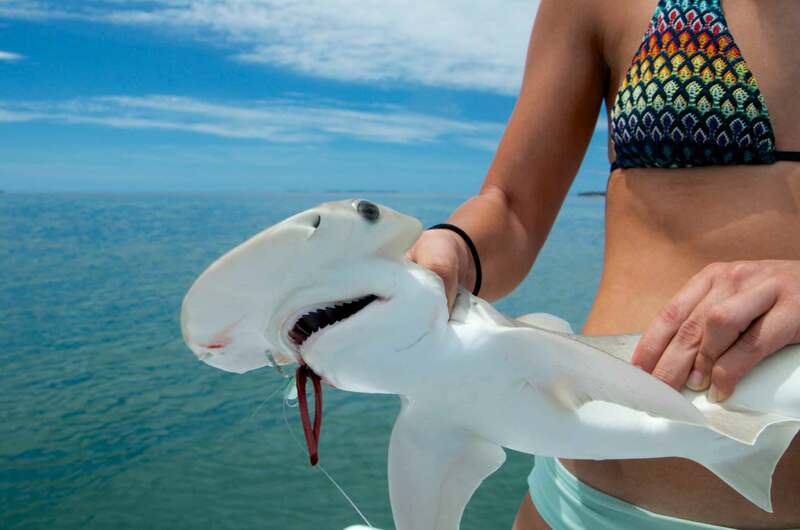 The Florida Keys as a whole, are the first areas that interact with these migratory slobs. We get early pushes of these fish around late February, March, and April, and the real madness will be in May and June. As the tarpon migration comes to a start the fish start to move in from the South, coming in from offshore in big packs. They congregate in “staging” areas where they seem to form a big line on the surface. These fish seem very comfortable and look as if they’re just hanging out and being social like at a big reunion. Eventually they will all shoot off into the shallower depths of Key West in packs of fifteen to twenty at a time. These fast moving fish will not eat when they are cruising to their destination. Once they get there, it’s another story. The most common places to fish for tarpon in Key West is the deep channels in Key West harbor. These channels hold tons of fish as they are filtering through to the backcountry, and eventually the Gulf waters. Fishing for tarpon in the inner harbor of Key West can sometimes be frustrating as they have a mind of their own and wrap you up on people’s anchors and/or cut off by passing boats. If you time it right, you can get a ton of hookups before it gets busy. Chumming dead bait seems to be the most effective way to fish for tarpon in Key West harbor, especially if it’s windy. Other than dead bait, we use live pinfish, crabs, and sometimes live mullet. Using live bait, we drift through the packs of fish we see rolling or mark them on the bottom and send our baits down to them. Most of the captains in Key West are courteous to one another and will help move out of the way if a hooked up fish is approaching their boat, just so everyone can avoid a tangle. This type of sportsmanship is what it’s all about, helping one another get to the fish. Once the tarpon move to the shallower channels throughout the backcountry, you will have the whole area to yourself, as well as more room to fight your fish. Sometimes I am the only boat within miles, which adds to the whole experience. It’s nice to be able to enjoy peace and nature while having your own school of tarpon to entice! As far as tackle goes to wrestle these silver kings, you don’t want to be underpowered. These fish range anywhere from sixty to one hundred and fifty pounds. If you know there are some smaller fish around, a 10-25lb rod with a 5-6000 series Quantum spinning reel will do the trick. I usually use a little heavier setup because there are always big fish moving through, and you never know when they’re going to hit your bait. I go with a 20-60lb rod, which has a fast action tip, yet has the beef in the backbone to hoist one of these pigs boat side. Along with that rod, I use a Quantum Cabo 80PTs reel lined with 30lb Fins XS braid. 30lb test is light to some anglers who fish for tarpon, as most are using 50-60lb tests. Using a little lighter line will give you much better casting distance and accuracy, as well as having more line on the reel. ANDE fluorocarbon ranging from 30-60lb is what I prefer to use for the leaders. I usually match my leader with the water clarity. As our waters of Key West our sometimes gin clear, we do get days of a little murkiness so we can get away with some heavier leaders. Lastly, hooks that I’m using are Owner 5/0 or 6/0 Mutu Light circle hooks. These hooks I’ve had the best hookup ratio with out of any other hook I’ve used for tarpon. There are so many different ways to catch tarpon, which makes it an ongoing adventure. From fly-fishing, live baiting, chumming, and sight casting on the flats, you’ll find out which style of tarpon fishing you enjoy the most. Tarpon are known for their fight, as well as their beautiful attributes, the way they roll through the water, and of course the way they leap out of the water. 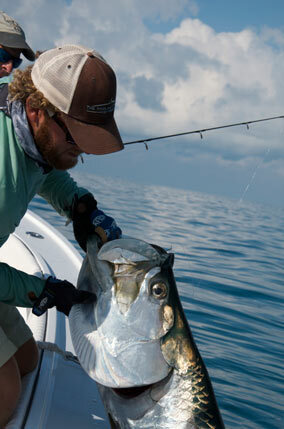 The best way to go about tarpon fishing is to book a backcountry fishing charter. This way you can fish for tarpon in the morning, and then shoot out to the backcountry later on to see what other species you can get into! Sometimes tarpon fishing will be all that my anglers want to do, so we stay around the schools and see how many we can hook up to and land. The average ratio of hooked to landed for tarpon fishing on a productive 4 hour (half day) charter is 5 hookups to 3 landed fish (depending on their size!). 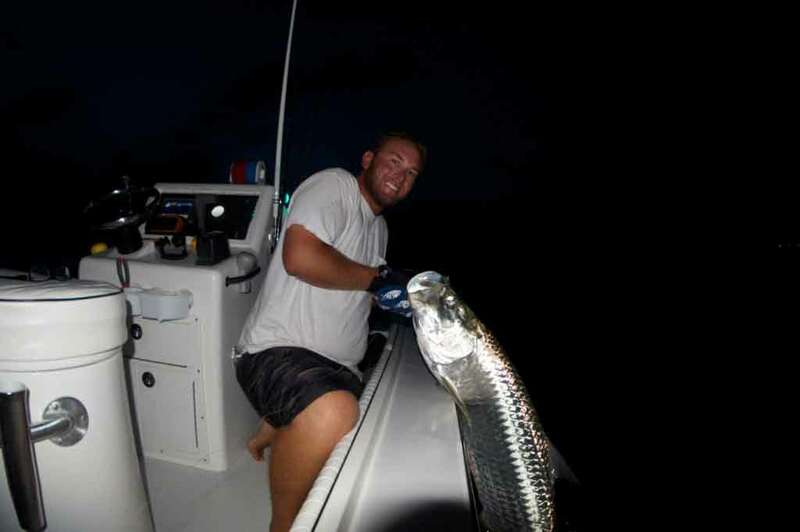 Book your Key West tarpon charter today!